The Clover B14A-B water cooler has all of the same high quality, commercial grade features that you have come to expect, in a sleek contemporary design. The rolled metal sides are super durable and are painted with special coating to keep them from fingerprinting. No more grubby finger print marks from the kids! The modern black and stainless steel finish is sure to go perfect in any high end residential or office setting. 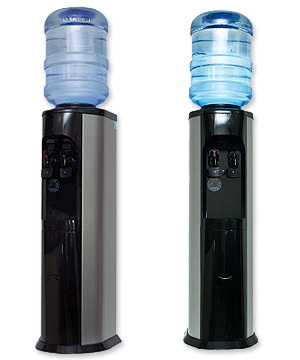 This bottled water cooler comes standard with high strength bottle piercing no spill top that fits any easy load 5 gal or 2.5 gal water bottles. Rest easy knowing that your floors are safe from the threat of leaky bottles with Cloverï¿½s patented leak guard system.